(M,D) pair for each gene is evaluated based on a null distribution estimated from technical or biological replicates or simulations in 2011GR. In NIOSEQBIO, theta=(M+D)/2 seems to be the statistic used for null distribution based on my understanding of its manual. Probability = 0.8 was the cutoff for differentially expressed genes in 2011GR. Probability = 0.95 (FDR) is recommended for biologically replicated samples. In its Tarazona2011GR, noiseq-real and noiseq-sim were used. These two versions have now evolved to noiseq and noiseqbio. NOISEQBIO is optimized for biological replicates. When using noiseq and noiseqbio, normalization and filtering can be done through parameters, 'norm'. Regarding the low-count filtering, it is not necessary to filter in NOISeq method. In contrast, it is recommended to do it in NOISeqBIO , which by default fliters out low-count features with CPM method (filter=1 ). # "r=20" seems to indicate 20 bootstraps when biological replicate number <5. 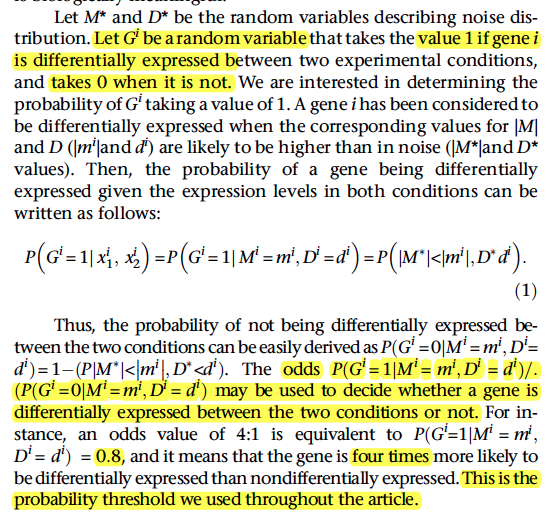 Authors stated that noiseq output prob are not equivalent to p-values? Q: what are "up" and "down" deg referenced to? S. Tarazona, F. Garca-Alcalde, J. Dopazo, A. Ferrer, and A. Conesa. Dierential expression in RNA-seq: A matter of depth. Genome Research , 21: 2213 - 2223, 2011. B. Efron, R. Tibshirani, J.D. Storey, V. Tusher. Empirical Bayes Analysis of a Microarray Experiment. Journal of the American Statistical Association , 2001.